The period since World War II has seen a dramatic increase in both country and regional studies across the world, and also in governments’ support of such studies and other forms of cultural diplomacy prompted by the belief that these soft power tools will promote their national interests and values. This chapter examines the causes within countries that contribute to the emergence and institutionalization of country or regional studies, including the differences between open and democratic societies in these factors. It then focuses on the factors that lead governments to support and promote the study of their country in other parts of the world. Particular stress is placed on the examples of the UK, France, the US, and China. The final section of the chapter examines the putative benefits that have derived from countries’ investments in this form of soft power. The chapter concludes that there is no guarantee that a government’s efforts to improve its country’s standing in other countries or regions of the world through support for the study of its country abroad will be successful and, moreover, that some of the premises that underlie the argument for such efforts warrant closer scrutiny. American Political Science Association. 2009. U.S. Standing in the World: Causes, Consequences, and the Future. http://www.apsanet.org/Portals/54/APSA%20Files/publications/TF_USStanding_Long_Final5.pdf. British Council. 2017. The Art of Soft Power, December. https://www.britishcouncil.org/organisation/policy-insight-research/art-soft-pwer. Canada, Department of Foreign Affairs and Trade. 2005b. Evaluation of the International Academic Relations Program, July (n.p.). http://www.dfait-maeci.gc.ca/about-a_propos/oig-big/2005/evaluation/relation_academic-academique.aspx?lang=eng. Canada, Department of Foreign Affairs and Trade. 2010. 2009–10 Departmental Performance Report. http://www.tbs-sct.gc.ca/dpr-rmr/2009-2010/inst/ext/extpr-eng.asp?format=print. Canadian Broadcasting Corporation. 2012. How the World Sees Canada: Knowledgeable People Give Their Views, July 1. http://www.cbc.ca/news/canada/how-the-world-sees-canada-1.1130322. Canadian Broadcasting Corporation. 2013. Scholars, Authors, Wary of Government Review of Canadian History. CBC News, June 16. Canadian Broadcasting Corporation. http://www.cbc.ca/news/canada/scholars-authors-wary-of-government-review-of-canadian-history-1.1377912. Cull, Nicholas. 2006. Public Diplomacy Before Gullion: The Evolution of a Phrase. USC Center on Public Diplomacy Blog, April 18. https://uscpublicdiplomacy.org/blog/public-diplomacy-gullion-evolution-phrase. Druick, Zoë. 2006. International Cultural Relations as a Factor in Postwar Canadian Cultural Policy: The Relevance of UNESCO for the Massey Commission. Canadian Journal of Communication 31 (1). http://www.cjc-online.ca/index.php.journal/issue/view/114/showtoc. Greene, Ian. n.d. Lessons Learned from Two Decades of Program Evaluation in Canada. http://www.yorku.ca/igreene/progeval.html. Goff, Patricia. 2017. Cultural Diplomacy. Oxford Bibliographies, April 27. http://www.oxfordbibliographies.com/view/document/obo-9780199743292/obo-9780199743292–0202.xml. International Council for Canadian Studies. 2016. Report on Activities of Member and Associate Member Associations. http://www.iccs-ciec.ca/iccs-reports.php. Japan Foundation. 2016. Annual Report, 2015–2016. http://www.jpf.go.jp/e/about/result/ar/2015/pdf/dl/ar2015e.pdf. Martin, Ged. 2010. Review of Canadian Studies in the New Millennium, ed. Patrick James and Mark Kasoff. Toronto: Published in 2008 by the University of Toronto Press. http://www.gedmartin.net/other-reviews-on-canadian-topics/211-patrick-james-and-mark-kasoff-eds-canadian-studies-in-the-new-millennium. Nye, Joseph. 2010. Soft Power and Cultural Diplomacy. Public Diplomacy Magazine, June 1. http://www.publicdiplomacymagazine.com/soft-power-and-cultural-diplomacy/. Redden, Elizabeth. 2015. New Money for Japanese Studies. Inside Higher Ed, May 19. https://www.insidehighered.com/news/2015/05/19/japanese-government-gives-15-million-us-universities-endowed-professorships-japanese. Rivera, Tim. 2015. Distinguishing Cultural Relations from Cultural Diplomacy: The British Council’s Relationship with Her Majesty’s Government. USC Center on Public Diplomacy. https://uscpublicdiplomacy.org/sites/uscpublicdiplomacy.org/files/useruploads/u33041/Distinguishing%20Cultural%20Relations%20From%20Cultural%20Diplomacy%20-%20Full%20Version%20%281%29.pdf. Robarts Centre for Canadian Studies. 2012. Update on the Petition Against the Cuts to Canadian Studies Programmes and Associations Outside of Canada, York University. http://robarts.info.yorku.ca/2012/07/update-on-the-petition-against-the-cuts-to-canadian-studies-programmes-and-associations-outside-of-canada/. Seib, Philip. 2010. Public Diplomacy and the Obama Moment, vol. II, no. 3. Layalina Productions, March. http://www.layalina.tv/wp-content/uploads/2014/07/2010-Mar-Philip-Seib.pdf. Sharma, Yojana. 2016. Universities Warned on ‘Pressure’ from Chinese Donors. University World News, June 7. http://www.universityworldnews.com/article.php?story=20160915134221500. Trilokekar, Roopa Desai. 2015. From Soft Power to Economic Diplomacy? A Comparison of the Changing Rationales and Roles of the U.S. and Canadian Federal Governments in International Education. Center for Studies in Higher Education, University of California, Berkeley. 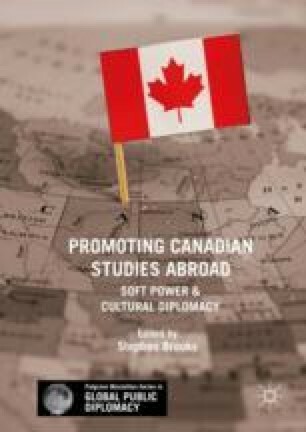 http://www.cshe.berkeley.edu/publications/soft-power-economic-diplomacy-comparison-changing-rationales-and-roles-u-s-and-canadian. United States, Government Publishing Office. 1983. Public Law 98-164, November 22. https://www.gpo.gov/fdsys/pkg/STATUTE-97/pdf/STATUTE-97-Pg1017.pdf. United States, Department of State. 2017. Study of the US Institutes for Scholars. https://exchanges.state.gov/non-us/program/study-us-institutes-scholars. Wadland, John. 2014. Canadian Studies at 50: An Address to the Peterborough Historical Society. http://www.peterboroughhistoricalsociety.ca/userfiles/file/John%20Wadland%20Remarks.pdf.